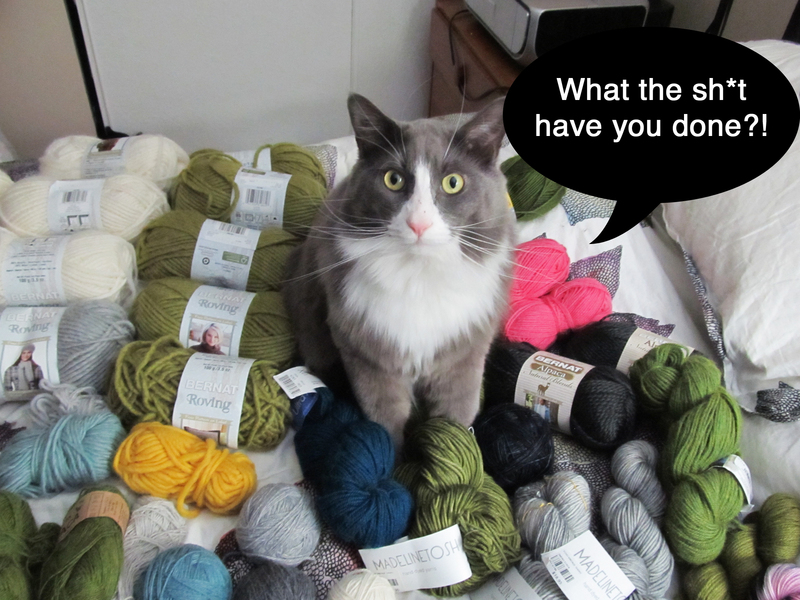 I was cruising the Ravelry forums last night and there was a thread about flashing your yarn stash for the New Year. 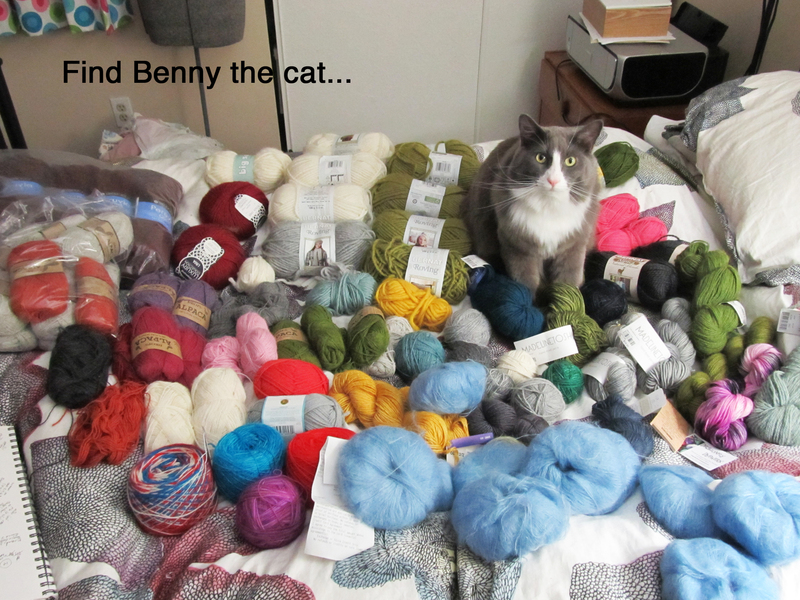 I thought, what a great idea to take stock of my yarn for designing. Even better, I can geek out and put an inventory list on the computer. I still haven’t gotten to that point though. 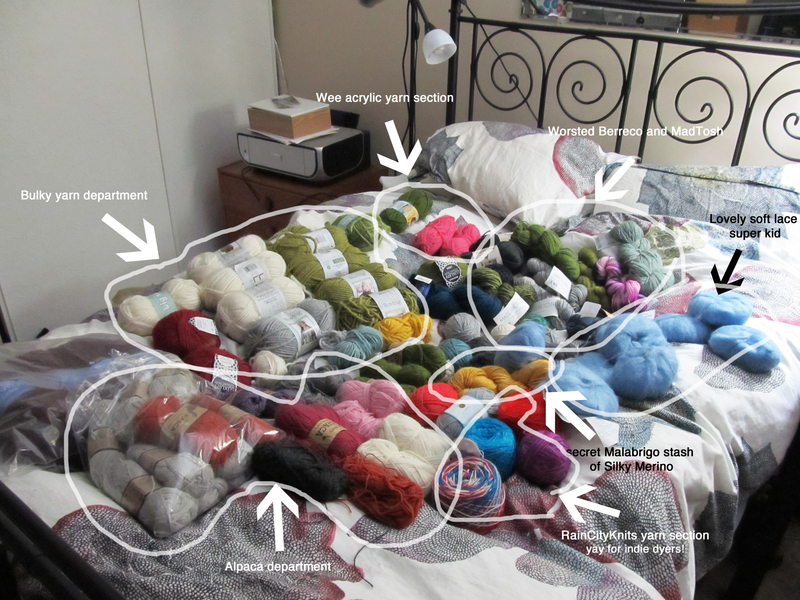 But as you can see, I have enough yarn to cover most of a bed. Hello everyone and happy 2013 to you all! Best wishes for health, prosperity and good times in the New Year. 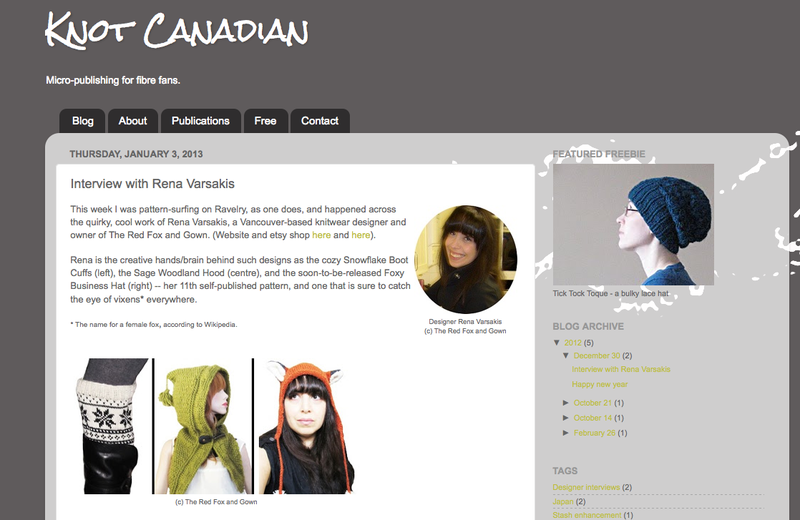 Some of you may be regulars to the blog and others are new this year following the great Ravelry giveaway of 2013. For those who don’t know, I had a free pattern offer on Ravelry on New Year’s Day. I was off to late start, and I decided to carry through the 2nd. I’m completely floored by the incredible response from Ravelers and I am so excited that so many people were inspired by the patterns to try them out and drop me a line to say thanks. You all are the best! And also if you don’t know, there’s a new group for The Red Fox and Gown on Ravelry. Following the momentum of New Year’s, I’ve set up a series of knit-a-longs (KALs). Join the group to share updates about your progress, photos and more. I have plenty of news to share as the year goes on, so it’s a great place hang to know what’s happening with The Red Fox and Gown. One of the exciting developments is the pending release of the Foxy Business Hat. It’s really soon, I promise! Thanks to all of the lovely test knitters who have done such an incredible job (and joining the group above may give you some insider leads if you want to test future RFG designs). Now I need to get through the last round of edits and she’ll be ready, no later than 15 January, promise. Another new thing for a New Year… I’m steeling against my natural aversion to seeing myself on video or photos, but I will kick off a video blog (I’m sure there’s a much cooler name for it) this month for your entertainment and information. I’ll cover upcoming news and designs, RFG events, reviews, random stories and even bits of history about fibre. I hope you’ll stick around and join the fun. Red Fox and Gown – Video Podcast 1. Introduction and where to find us on the web.